Windows & HP To Challenge iPad Soon? Windows has practically been left out of the race when it comes to modern mobile devices. It’s a rather shocking occurrence considering the dominance they had with the desktop PC market. In the current scheme of things, all the talk is about the battle between Apple and Android – in the latest generation of the iPad has, for the most part, won out. Windows on mobile devices is all but forgotten. But a sleeping giant like Windows will only sleep for so long. The upcoming Microsoft Windows 8 operating system is designed specifically for mobile devices. And it looks like Microsoft has teamed up with another giant, one that tripped and fell on its face during their first tablet launch, the HP Touchpad. Heck, Hewlett-Packard tripped so hard that they just about gave up on making computers all together. Things have changed and now Microsoft and HP have come up with what may be the best iPad competitor yet. It will be called the HP Slate 8. Much of the info we have so far is based on rumors and a leaked photo of some training material that first appeared on Noewin.net – a partial screen grab of which is above. The Slate 8 will have a 10.1 inch screen, be slightly thinner than the iPad, ll accept multi-touch or digital pen input, and features a suite of security software geared toward enterprise users. We first heard of the new tablet from Meg Whitman back in February. There’s been no word on when the tablet will be launched. 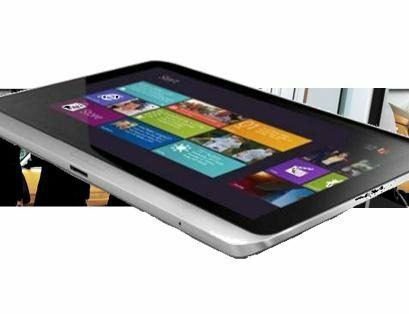 But Windows 8 is rumored to be out this fall… we can hope that the Slate 8 will be launched right along with it.